Four Sevens Holiday unit has 2 en-suite bedroom with an additional enclosed balcony used as a third bedroom and accommodate 6 guests. This beautiful, well equipped unit is located in Ramsgate. The unit is fully equipped, self-catering with full DSTV. Open plan lounge, dining room and kitchen. You are close to Margate beach and evening entertainment. An affordable breakaway or holiday destination. Linen and hand towels are supplied. 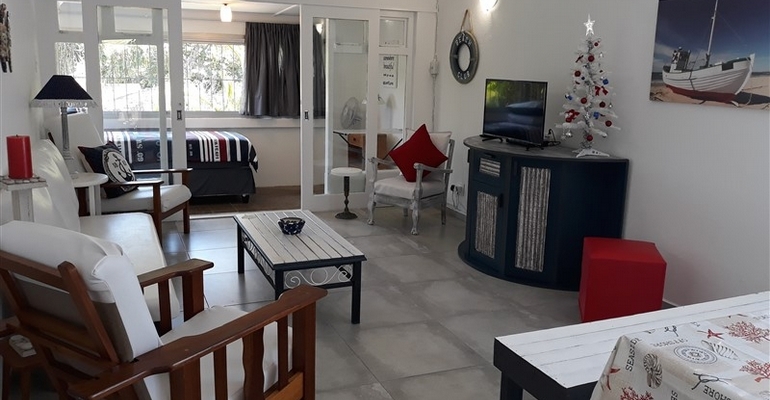 Set in a quiet block, yet walking distance to Spar, various shops and a mere 500 meters from Ramsgate Blue flag beach, Blue lagoon restaurant and the Waffle house. This is a very neat unit that is secure and on the 1st floor with inland views. There is a lovely garden and braai facilities including a lock up garage.